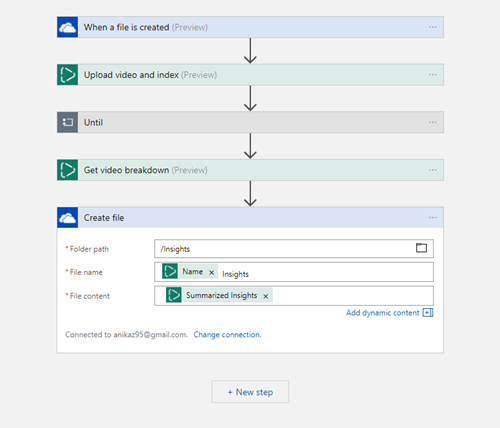 With the Video Indexer connector for Logic Apps, you can now set up custom workflows connecting your most used apps with Video Indexer to further automate the process of extracting deep insights from your videos. In this blog, I will walk you through an example of using the Video Indexer connector in a Logic App to set up a workflow where whenever a new video file is created in a specific folder of your OneDrive, the video is automatically uploaded and indexed. 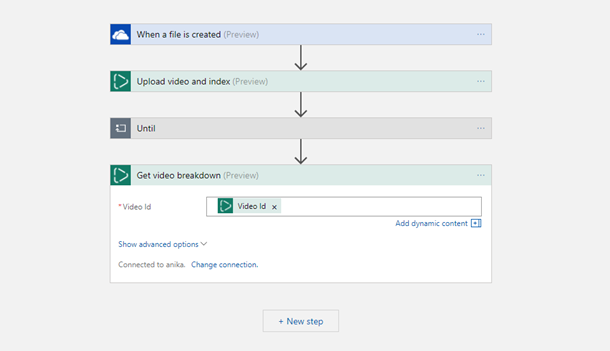 Once completed, the insights of the newly indexed video will be stored as a JSON file in the designated folder of your OneDrive. Currently, there is a 50 MB file size limit for OneDrive and other storage connectors to trigger. 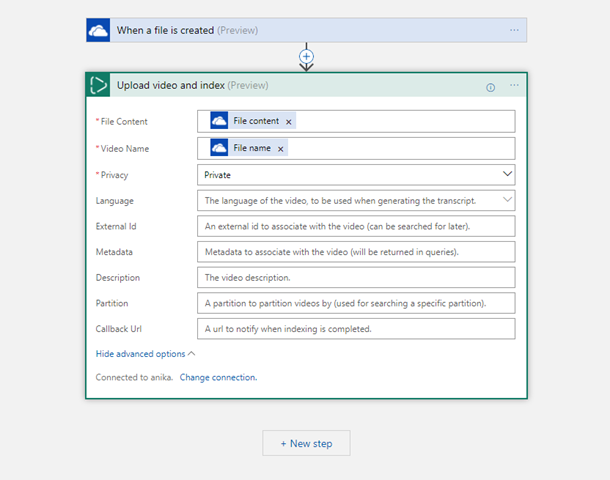 The Video Indexer connector allows you to upload a video via file content from a storage connector or a shared access signature URL. 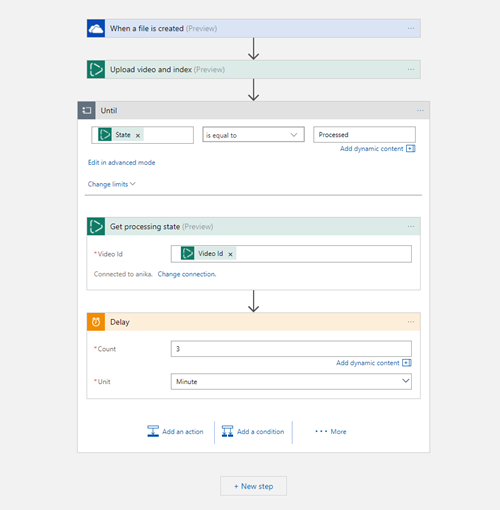 Although there is currently no way to access a URL to the video from storage connectors, we are in the process of adding in this feature on OneDrive, OneDrive for Business, and Azure Storage. Once implemented, we will be able to work with videos larger than 50 MB. However, we have to work with the limit for now. To begin, log into your Azure Portal and create a new Logic App. 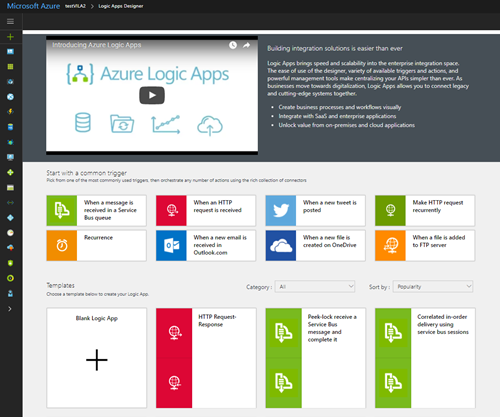 You can follow the tutorial to learn how to create and deploy a new Logic App. Once you have created the Logic App, go to the Logic Apps Designer and select Blank Logic App. The first thing we will need is a “Trigger” that will fire off an event when a new file has been created in your OneDrive folder for videos. In the search bar for connectors and triggers, search for “OneDrive”. You will see options for OneDrive (consumer) and OneDrive for Business. You can do either based on the account that you have or want because they have similar steps. In this tutorial, I am using OneDrive. Click on the OneDrive connector. 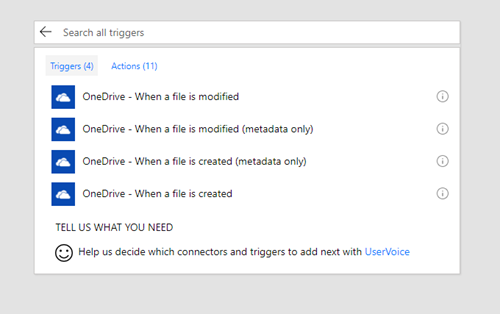 This will show you all of the triggers available for OneDrive. Select “When a file is created”. This will fire the trigger in the Logic App each time a new file is dropped into the designated OneDrive folder. Once complete you will be prompted to sign into your OneDrive account. After you have signed in, you will see the trigger and its different fields. For the Folder field, click on the folder icon and navigate to your folder for videos. I have selected a folder for videos on my OneDrive called “Video”. You can choose any folder that is appropriate or create a new folder specific to your own workflow. It is important to note that this folder should only have video or audio files. Any other files will result in an upload error in the Video Indexer connector. You can also set how often you want the trigger to check whether a file has been created in the specified folder. Under the “How often do you want to check for items?” section, I have set Frequency to Minute and Interval to 3 to have my trigger check every 3 minutes. 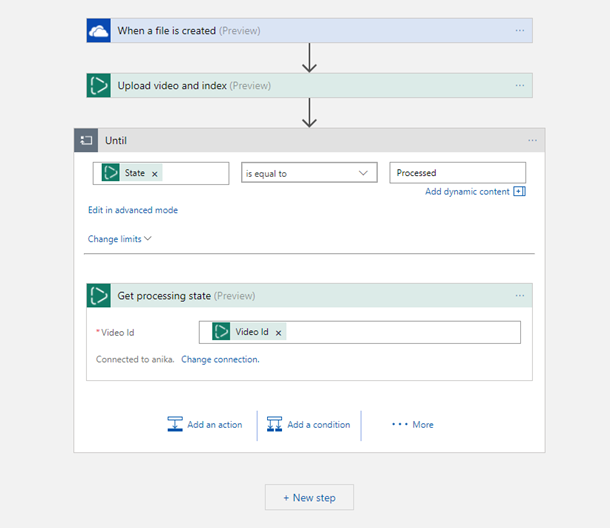 Next, you will need to set an action that uploads the video that has been created in your OneDrive folder to your Video Indexer portal. Click Next Step and select Add an action. 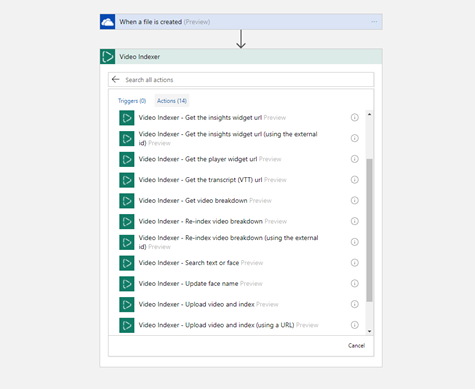 Search for “Video Indexer” and select the Video Indexer connector. You should see the different actions listed out. We currently do not have any triggers for the Video Indexer, however, triggers will come later when support for WebHooks will be added to the Video Indexer API. 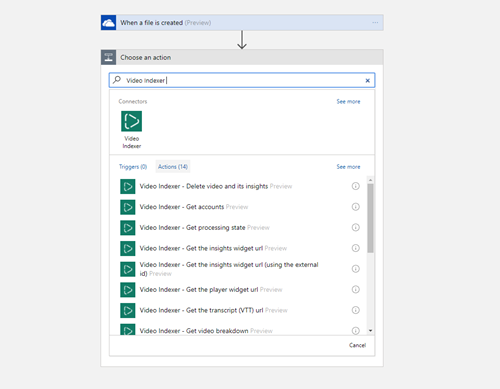 You should see two options for uploading a video onto your Video Indexer portal. One is called Upload video and index and will allow you to upload a video using file content data. 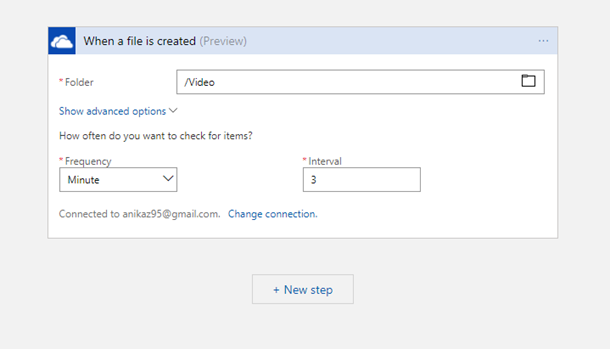 The other option is called Upload video and index (using a URL) and will allow you to upload a video using an URL. Both options will automatically index the videos upon upload. 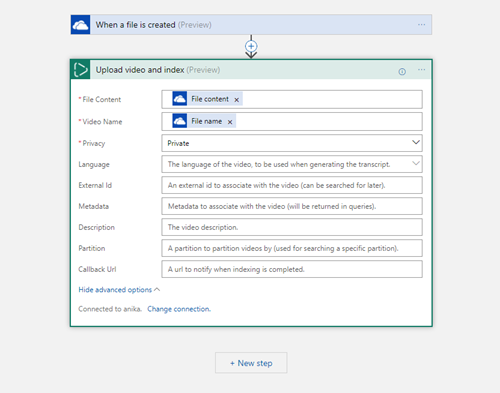 In this tutorial we will be uploading the video using file content data, so select Upload video and index. 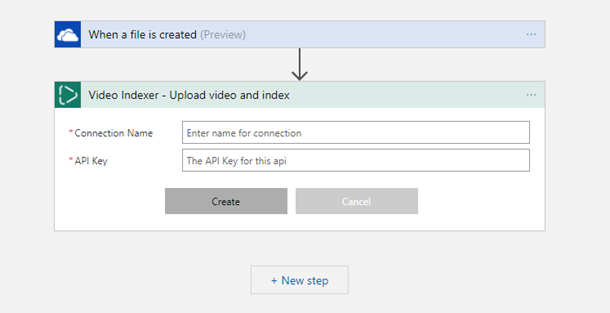 You should be prompted to create a connection using your Video Indexer API Key. Enter in a name for the connection as well as your API Key. 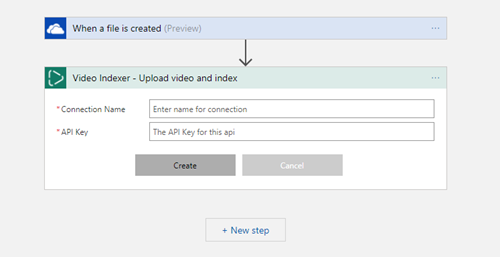 You can follow the tutorial to learn how to subscribe to the Video Indexer API and how to access your API key. Upon creating the connection, it should open the Upload video and index action. If you click on any of the fields, you should see response elements from the OneDrive trigger. 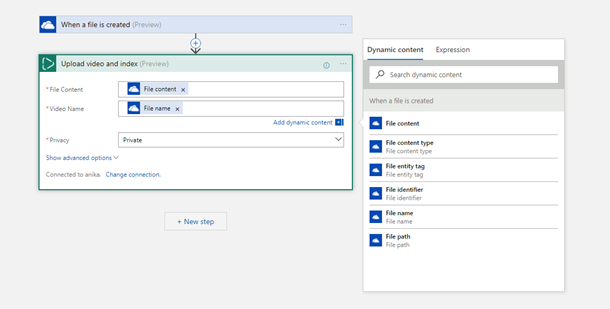 For the File Content field, select the File content response element. For Video Name, you can select the File name response element or type any name that you want. Set your privacy as you want. Here, I have set privacy to “Private”. Upon clicking Show advanced options, you will see many more fields that you can fill out to provide more information on your video. I will be leaving them blank here because they are not required fields. The Upload video and index action returns the id of the video upon upload, however, that does not mean that the indexing has been completed. For this, you need to add in a check that will only let the Logic App move forward if the video has been fully processed. Select New Step and then More. You can then select Add a do until. You should now see an Until loop. Within the Until loop, select Add an action. Search for the Video Indexer connector again and select the action Get processing state. For the Video Id field, select the Video Id response element from Upload video and index. For the “Choose a value” field in the Until loop, select the State response element from Get processing state. For the field that says “Choose a value”, type in “Processed”. The State being “Processed” is an indication that the indexing of the video is complete. Within the Until loop and after the Get processing state action, select Add an action. Search for and select the Delay action (it is a part of the Schedule connector). You will need to set the count and unit fields to essentially determine how often to check if the State is “Processed”. Here, I have set Count to “3” and Unit to “Minute” to check every 3 minutes. The next step is to attain the insights of the newly processed video. 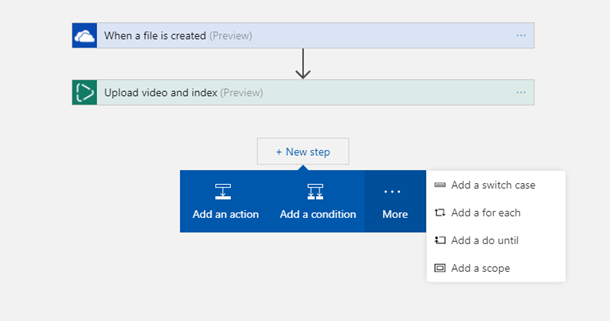 Outside of the Until loop, select New Step and search for the Video Indexer Connector. Select the Get video breakdown action. For the Video Id field, select the Video Id response element from Upload video and index. This action will give you all of the insights of the video. Now that you have the insights of the video through Get video breakdown, you will now create a file with the new insights and store it in an appropriate folder of your OneDrive. Select Add an action and search for the OneDrive connector. Select the action Create file. 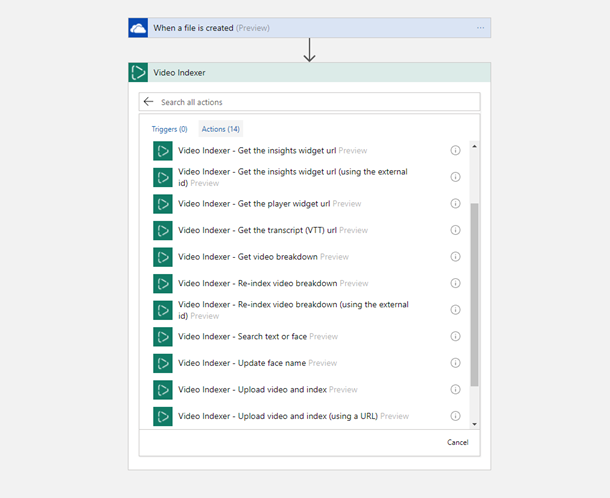 For the Folder path field, click on the folder icon and navigate to the appropriate folder for storing the insights of your video. I chose my folder called “Insights”. For the File name field, type or select a name for the new text file. Here, I selected the Name response element from the Get video breakdown and typed in “Insights” after. For the File content field, select Summarized Insights or whichever specific response element from Get video breakdown that you want to store. Learn more about the response elements. Save your logic app, and you are done! You should now test the logic app. Start by selecting Run. 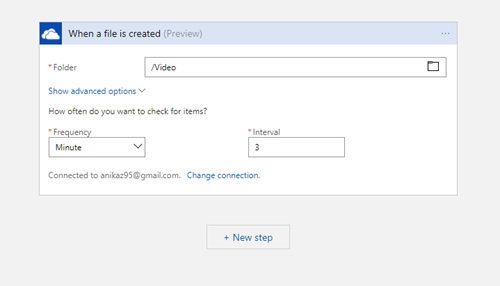 Then, to trigger the logic app, upload a video file onto the OneDrive video folder that you specified in the trigger. As mentioned before, there is a 50 MB file size limit for the OneDrive trigger, so you will need to select your video file appropriately. You should be able to look at the run details of your Logic App under the Run History section of the Overview page of your logic app. 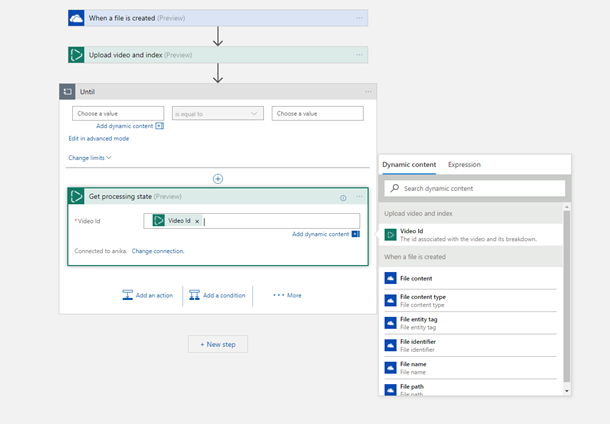 You are now ready to test out many different combinations of workflows using the Video Indexer connector to find what works best to make your processes automated and more efficient. 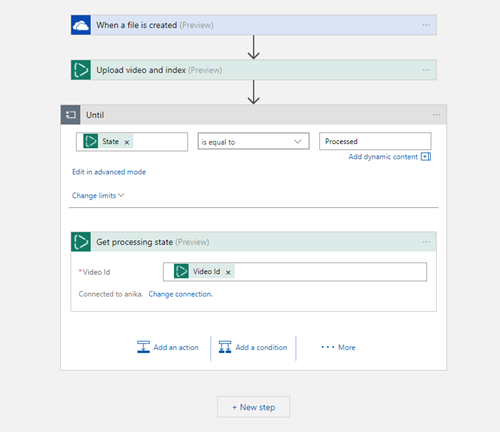 You can create custom workflows that integrate live and on demand workflows in Media Services with Video Indexer using samples from the Media Services GitHub site and the Video Indexer connector as long as your video files are within the 50 MB limit for now. 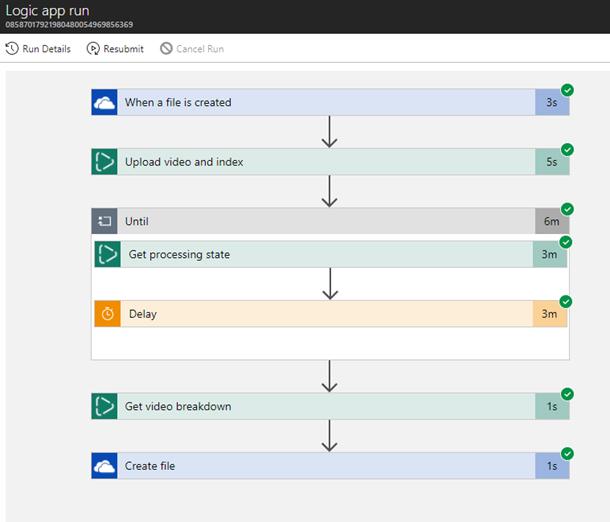 You can also create a Logic App to push the insights from Video Indexer into systems like Cosmos DB and use Azure Search to query across the metadata or to join the insights to your own custom metadata.